Have you been dreaming of adding an elegantly designed pool to your property, but having a hard time deciding between a traditional style and a pool with a negative edge, wet edge or vanishing edge design? Not sure what the differences are? Let’s take a look at the different pool styles, edges and designs to help you pick the look that would work best for you. A pool in your backyard transforms your outdoor space into an area of endless possibilities. You can host pool parties for the kids, hang out and relax with your friends, and even work on your fitness. But a regular pool is only so impressive. That’s why we offer negative and wet edge pools. But what does that mean exactly? Negative and wet edge pools offer a more stunning and creative pool design. Some people call these types of pools vanishing edge pools. Negative edge, wet edge and vanishing edge pools all refer to the same type of high-end design. In a negative or wet edge pool, one or more sides of the pool are slightly lower than water level, which creates a spill over. The spill over creates a waterfall on one end, and provides the illusion of an endless pool edge while you’re swimming or from looking at the pool from opposite the vanishing edge. This upscale look will give your pool a spa-like vibe, and can be especially great for featuring the view in your backyard, though it’s also important to consider that there are some additional space considerations. For example, the water traveling over the edge doesn’t magically return to the pool. Instead, you need a catch pool which serves as a reservoir that recycles the water into the main pool. This requires additional space and needs to be considered when selecting a design for your home. Whether you’re installing a pool just for you and your family and friends to enjoy or you want something simple and practical, adding a pool can really increase the value and enjoyment of your home. At Crites Custom Pools, we can help you transform your outdoor space with a unique pool design. We can work with you to provide a free estimate and discuss the considerations at your property to help you decide on the best look for your home. 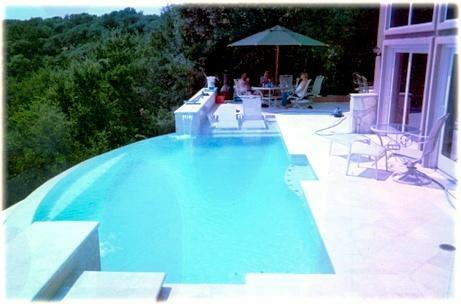 To learn more or to get started on planning your new custom pool, call us today at 512-759-2630.